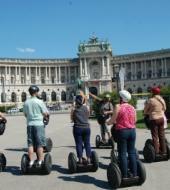 The Segway Tour is the best excursion in Vienna for anyone who wants to do something different and original. The guided tour starts with a Segway instruction of 15 minutes to get used to handling this modern means of transport. Imagine cruising effortlessly through the beautiful parks and around historic buildings while receiving a great orientation, informative historical and current-day information, heaps of unique and fascinating stories, fantastic photo ops and superb personal service from your guide.